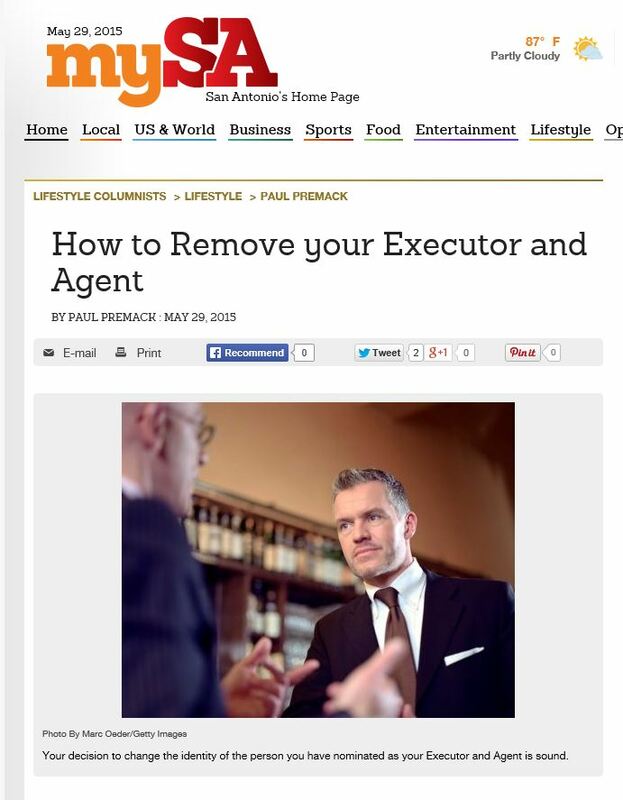 This column first appeared in the San Antonio Express-News and its MySA.com website on May 29, 2015. Dear Mr. Premack: A few years ago I named a trusted cousin as my Executor and as Agent under my Durable Power of Attorney. He and I recently had a disagreement, and although we are not angry with each other, I feel that I should choose someone else as Executor and Agent. Also, I listed my cousin as a cosigner on one of my checking accounts. How do I change the Executor and Agent, and how do I remove his name from my bank account? – K.U. Your decision to change the identity of the person you have nominated as your Executor and Agent is sound. The best and highest qualifications for your Executor and Agent are honesty and trustworthiness. Clearly the recent disagreement lowered your opinion of those traits in him. You want your interests and wishes to be honored. Your current legal documents no longer reflect your wishes. To change your Executor and Agent, you must meet with the attorney who wrote your Will and Durable Power of Attorney. When you make a replacement Will, the old document is destroyed and entirely replaced. The new document does not contain any of the outdated information, so it has no reference to your cousin being nominated and then un-nominated. The Durable Power of Attorney can only be modified with an entirely new replacement Durable Power of Attorney. The new Will revoke the old, and nominates someone new as your Agent. You must, however, inform your cousin that you have revoked his status as Agent. You do not need to inform him of the identity of your new agent, just that he is no longer Agent. It is best to inform him in writing, and to ask for any copies he may possess to be returned to you. When you appoint an Executor and an Agent, you should also appoint at least two alternate Executors and Agents (if you have two other trustworthy honest people who are willing to be named). Selecting alternates means that if your first nominee should die or become disabled, you have no need to pay for another change to your Will and Durable Power of Attorney because you already have a backup plan in place. Taking your cousin’s name off your bank account can be more difficult. It depends somewhat on which bank you are using and what its internal policies require, but generally any change to an account require that both signers request the change. If you feel that discussing this with your cousin would be easy, then the two of you can go to the bank together to take his name off the account. If you want to avoid involving him, you could simply transfer all of the money from that account into a different account on which he was never a cosigner. Emptying the account is generally viewed by the bank to be the same as closing the account. Before you do so, talk to your banker to be sure their internal policies translate an empty account into a closed account. When you have named an Agent in a Durable Power of Attorney, there is really no need to add that person as a cosigner on your bank accounts. If you become incapacitated, the Agent can access your account using the Durable Power of Attorney. If you feel more comfortable listing that person as a cosigner, consider using a special type of account called a “convenience account”. While Texas law authorizes convenience accounts, not all banks offer them, so again, ask your banker. If they do offer convenience accounts, you can list your Agent as a cosigner but retain full control over the account. At your whim and unilaterally you can remove the Agent from the convenience account. You do not need the Agent’s cooperation or permission to be removed from the account. Discuss these issues with your attorney to be sure that all of your account designations integrate properly into your overall estate plan. Should Agent/Executor be given rights of survivorship?